Oh man I'm really liking the feel of this... keep at it! 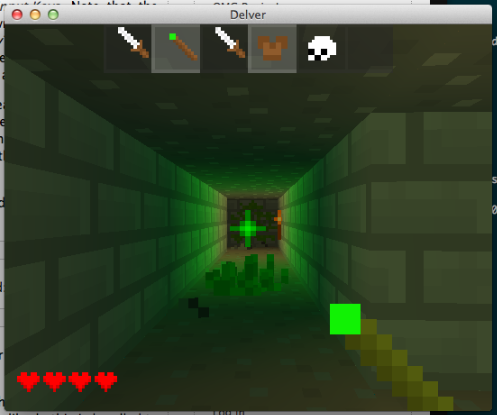 Had a productive morning and implemented saving, loading, and permadeath - now it's almost a roguelike! Can test it out by downloading the latest version. It currently only saves on quit, probably should also save during level transitions. There's support for multiple save slots but until I add a start menu it's always using slot 1. Making more progress, have the start of an inventory system now and made wands with projectiles that you can zap at things from afar. For the inventory I think I'll have a hotbar (shown above) that you can use the number keys (or tap with a touchscreen) on to equip / use items along with a pack space grid (5 x 3?) that will be shown by bringing up the inventory screen. Alternatively, I could simplify things by expanding the hotbar and using it as the actual inventory and not need an inventory screen at all - at the loss of not being able to lug tons of stuff around. If I did that I'd expand the bar to 10 or 12 slots and reserve the first five for equipped items: Weapon, Chest Armor, Leg Armor, Ring, and Amulet. Any thoughts? After playing it for awhile, it definately needs an automap. Keeping a close eye on you. Like the unobtrusive hotbar and would be happier hitting a button for the full inventory then having more of my screen taken up while playing. Woo! There's a sorta working inventory system in but until I add in screen switching support it's just the hotbar portion. The 1- 6 keys equip or unequip an item, and the last unequipped item is selected in red and can be dropped via the 'Q' key. Try it out! It works for now but I'm not happy with the selecting items to be dropped process, it may work better if pressing the number key for an item makes it your currently held item, and then for held items Q would drop it and Space would use it: either attack, drink, or equip depending on the item type. I liked the graphic style. Simple and beautiful, like Realm of the Mad God. Gameplay is similar to Minecraft. Management at all uncomfortable. I would have him transferred to the mouse. It turns out very interesting. Add to your bookmarks. I would be good to have played it if you could improve the management and added any interesting things and if it is, of course, would be online multiplayer. And yes, after I tried to choose a skull in your inventory and use it, the game died. And after that, the game does not want to run. Same problem here, except it was trying to unequip a sword what froze it. ^ Sounds like some inventory / savegame weirdness. Could try deleting that 'saves' folder that gets created under where the game is run from if it decides not to start. As for the inventory, I plan on releasing another alpha build tomorrow with a revamped hotbar system that hopefully takes care of those crashes along with making it easier to use. Been wearing my game designer hat lately with the focus of making a three or four level starter dungeon that can be released as a testing ground for all the game mechanics. First order of business: combat and random item drops. Melee weapons have dials to tweak now: base damage stat, random damage roll ( 0 to n ), weapon reach (daggers vs longswords), attack speed, and knockback / stun time. I'm trying to stumble upon a system that discourages button mashing and backpedaling, but it's hard to do that without adding in blocking or miss rolls so I'll end up doing one or the other. What sounds better, accuracy rolls based on a stat and armor or being able to block with a weapon / shield? I don't really like to just join a topic and report bugs right away, but I downloaded this awesome game and played it for a few minutes, then quit. When I tried to play again a while later, I just got an empty black window. Despite the fact that the game is completely wet, it got me damn hooked. What? Charm and atmosphere. It's probably crashing on trying to load the savegame - it saves automatically on quit and tries to resume it on open. Although it's supposed to start a new game if it fails loading - not crash to desktop. If you copy that JAR file into a new folder and run it, does it work then? Interrupt, i will try it, but i has this error too. Yes it does work, as well as deleting the save file. I'm really looking forward to more advanced versions. I would have him transferred to the mouse.I would be good to have played it if you could improve the management and added any interesting things and if it is, of course, would be online multiplayer. 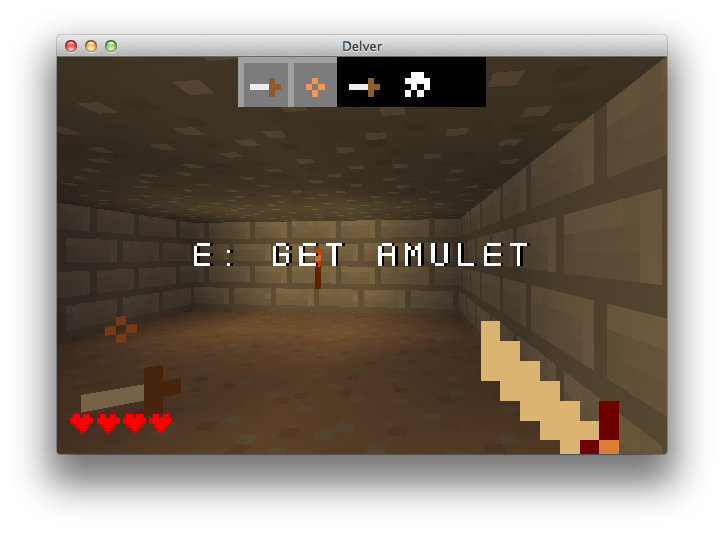 If you will do it, Delver can be one of my favorite games. Implemented a new monster and item manager to generate random items from json data files, and revamped the combat system to include all the new weapon and armor stats. 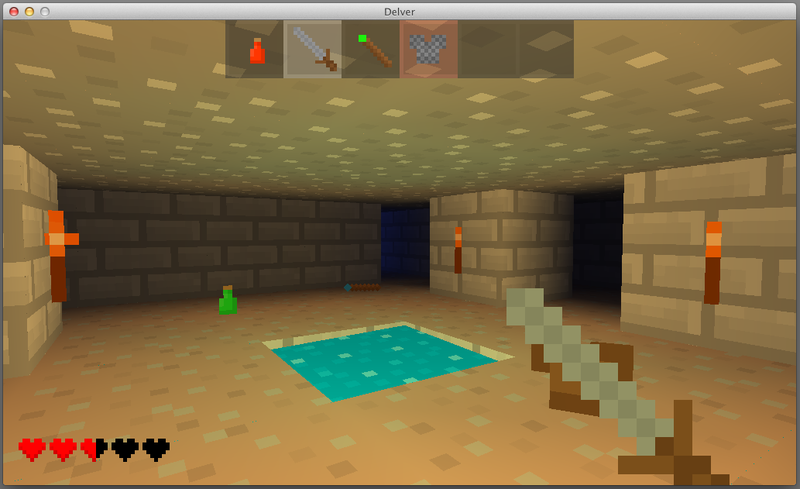 Also fleshed out the second and third dungeon levels to provide a taste of how the game should play. There's no goal yet besides surviving, my plan is to add a quest item into the final room (the one shown above) and make the player try to escape the dungeon with it while monsters keep generating around them.